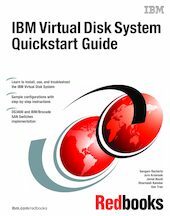 This IBM® Redbooks® publication is a quickstart guide for implementing an IBM virtual disk system. We use the term IBM virtual disk system to collectively refer to IBM SAN Volume Controller (SVC), System Storage Productivity Center (SSPC), IBM mid range storage (DS3400 in this case), and IBM/Brocade SAN Switches. IBM System Storage SAN Volume Controller (SVC) is a virtualization appliance solution that maps virtualized volumes visible to hosts and applications to physical volumes on storage devices. The IBM virtualization technology improves management of information at the "block" level in a network, enabling applications and servers to share storage devices on a network. With IBM System Storage Productivity Center (SSPC)™, administrators can manage storage along with the other devices in the storage environment. This greatly simplifies management of even the most basic storage environments, and the awareness of environment helps to reduce accidental errors that can cause downtime. SSPC comes preloaded with IBM Tivoli Storage Productivity Center products, enables end-to-end disk management on single screen, and supports management of heterogeneous systems and devices.